80 Pages for this Quarter: Completed, but mostly due to Nano. Planning: Still going. I've gotten over 60,000 words for Nano right now, so I think I'm going to use my Scrivener software and do some major rearranging of scenes and things. I think I may need to make better sense of it all before I continue any more planning of big things. Fried Chicken: I haven't had any in the past week. Pizza: I've managed to stay away from that, too. Exercise: There's one that I'm failing miserably on. I have to find a way to organize my life better. It will come in time. I hope everyone else is doing well. It's going to be short and sweet today, as I'm getting the flu that's been slamming my roommates to the ground. So, it's off to the kitchen to make a big batch of homemade soup to get me through this crap. Happy pre-Thanksgiving, everyone! I've been running around like a crazy person buying things for Thanksgiving, and writing like a crazier one. 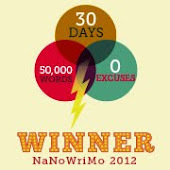 I cracked the Nano 50,000 word goal the day before yesterday, reaching 50,088. Not that I'm quitting for the month - oh, no! In fact, I've got a meeting with writing friends tonight. But I've got to get my Thanksgiving prep done first. I've made my 80 pages for this round, having done over 200 just for Nano. Planning has suffered somewhat this month, as I've been focused on output alone. I've had a weird few scenes centered around a therapist office. My heroine had a breakthrough - and a meltdown. It made me tear up and leak a bit while I was writing it. (Since I was at work at the time, that might have been not so great. Luckily, my students know what I'm like and it doesn't faze them.) 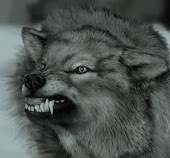 I got a couple of interesting motivations, from the werewolf guardian/secret assassin, so that's going to be fun to play with. Especially since one of her phone calls is overheard by the heroine's lover. Talk about it hitting the fan! Exercise and junk food aversion fell by the wayside for the past week or so. My words were more important than anything, and my lack of kitchen participation showed it. Oh, well. Off to go make some applesauce and some cranberry/orange compote. For all of us mathematically-inclined (or crazy) people out there, I was thinking about a new exercise today for my students. It was an exercise in junk food. Specifically -- cookies. Get the answer right for your type of cookie, and you get to eat said cookies. Personally, I can't try the cookie thing, because I'm still trying to lose weight. And it's going slowly, I'm afraid. So is the exercise. But some of my other goals are going well. For instance, my planning is still going forward, as is my writing. My Nano word count is just over 20,000. I have no idea what my page count is, but I'm sure it's inching toward my 80 pages for this quarter. Not so good on the fried chicken front. I bought some last night on my way home from work. Once I got there, I went to bed. I was utterly exhausted, and I let the guys figure out whatever they wanted for dinner. I haven't ordered any pizza though, so that's still good. Fighting the junk food craving is a day to day adventure. But I sure wish the cravings would go away. Owww. You can tell Nano's here. Between the caffeine and leftover Halloween candy, I feel like crap. I've had three cups of coffee already this morning, and I've written almost 3,000 words. The manic hamster in my head is working well; but I can't say the same for the rest of my (in)sane self. Goals? That's been a bit of a hit or miss. Let's take a look. Planning is going well. And since we entered the madness of Nano four days ago, I've written 39 pages. Since I only planned on 80 pages this round, I'm feeling pretty good about that. So I'm on track for a win in that category. Giving up pizza and fried chicken? I haven't had any pizza. I can't say the same about fried chicken, but I can say that I've cut down. In fact, there's still chicken in the fridge. And if my roommate doesn't eat it by dinner, it's going in the garbage. (Oops...hang on a moment. I've got to take out hamburger to make chili with tonight. Brb.) Okay, I'm back. Exercise? We don't even want to discuss that. But I have plans to get there as soon as my coffee stomachache goes away. Since I've written over 2,000 words today so far, I figure I can allow myself that break. Prepared food? I've gotten LOTS better with that. I'm still resisting going into certain aisles in the grocery store, even though Near East has some outstanding grain mixes. One of these days I'll get around to figuring them out so I can do them at home. On a different front, last Saturday my roommate took his blood pressure at our local grocery store. It was 238/137. To say that's not good is an extreme understatement. Immediately the Mountain Dew was gone, and he cut back on cigarettes from 20 per day to 8 per day. He's steadily decreasing until he's quitting. I got the idea from how George Carlin finally quit cocaine. He just weaned himself off it gradually. I figured that would work for cigarettes too. The good news is that he's sleeping better and his constant headache is gone. Yeah, I cut out the salt for the most part, too.